Dinosaurs back in the water and it feels sooo good… There are probably fewer narratives, memes, and dialogues as storied as the on and off again love affair between dinosaurs and the water in both scientific and popular forums. From pre-renaissance snorkeling duckbills and bottom walking brontosaurs to fanciful water world assertions that all dinosaurs were aquatic to bona-fide actual aquatic dinosaurs such as Spinosaurus the concept of dinosaurs in the water is one that is not soon to leave us. Dinosaurs sloshing, mucking, wallowing, foraging, and hiding in the water is an evocative suggestion because such depictions are not without analogue in many modern terrestrial tetrapods and large mammals in particular. It is a contention of mine and this piece that just because an animal is not explicitly aquatic does not negate the potential for water to still shape and inform significant aspects of its biology and anatomy. The opening depiction of a bottom running Ankylosaurus, kindly provided by Robin Liesens (Dontknowwhattodraw94), represents what I view as a logical culmination of the ornithischian body plan with relation to water. Ankylosaurus was quite possibly a sinker not a floater. An evolutionary arms race in ornithischians that gave this branch of dinosaurs especially thick, dense skin to protect from both theropods and intraspecific combat; an osteoderm studded skin; lack of skeletal pneumaticity; thick bones. What this creates is the distinct possibility that ankylosaurids and perhaps other "dense" ornithischians - especially among thyreophorans and marginocephalians - did not actually float in the water as humans, birds, and most terrestrial mammals do but would sink right to the bottom like hippos, tapirs, and water chevrotains. Bottom punting animals have a rich history here at antediluvian salad: bottom punting Spinosaurus is the ultimate conclusion I reached regarding the most likely aquatic propulsion for that animal. A necessary caveat of a good bottom punter that utilizes body density (as opposed to changing/shifting lung volume like aquatic turtles & crocodiles) is that actual swimming ability decreases as punting ability - and therefore body density - increases. This creates the paradoxical situation in hippos where they can not actually swim - hippos can not cross deep bodies of water because they sink like a stone. The same situation may have occurred in several ornithischians with thick dermis - not necessarily because they were semi-aquatic like hippos - but because they had embarked on a social and defensive strategy of thick skin, armor, and dense non-pneumatic skeletons. Body density and therefore punting ability and the inferred possible loss of actual swimming ability is an interesting side effect of their particular defensive anatomical pedigree. All of this discussion should be couched in the recent elucidation (not withstanding a rebuttal) of a revelatory linkage of theropods and ornithischians into ornithoscelida (Baron, 2017). One of the most interesting questions that this linkage of neo-theropods and ornithischians raises is "why would ornithischians have lost the highly pneumatic (and presumably air sac filled) skeletons that most likely was ancestral to both ornithischians and theropods?" Several commentators on the Tetrapod Zoology post on ornithoscelidia approach this question and suggest that the ability to bottom feed on aquatic vegetations is a potential reason. I agree, but I would embellish this reasoning with a more dire and immediate consequence: ornithoscelidians did not want to be sitting ducks. Sitting Duck: A person or thing with no protection against an attack or other source of danger. Theropods we know were full of air - it is no stretch to imagine that, when immersed in water, they would have floated like a buoy. Maybe not sitting so high in the water as modern ducks but possibly with much of the head, neck, and even some of the back out of the water. This buoyancy would have made theropods excellent patrollers, explorers, and navigators of aquatic environments. It also may have helped in dispersal situations and survivorship of catastrophic aquatic inundations such as tsunamis and the relatively frequent storms surges, tidal inundations, and hurricanes that we should expect in hot house climates. The floatability in water made diving a little bit difficult but not impossible: for theropods wanting to get under the water they simply point their nose in the direction that they want to go in and enact rear propulsion from the legs and tail. 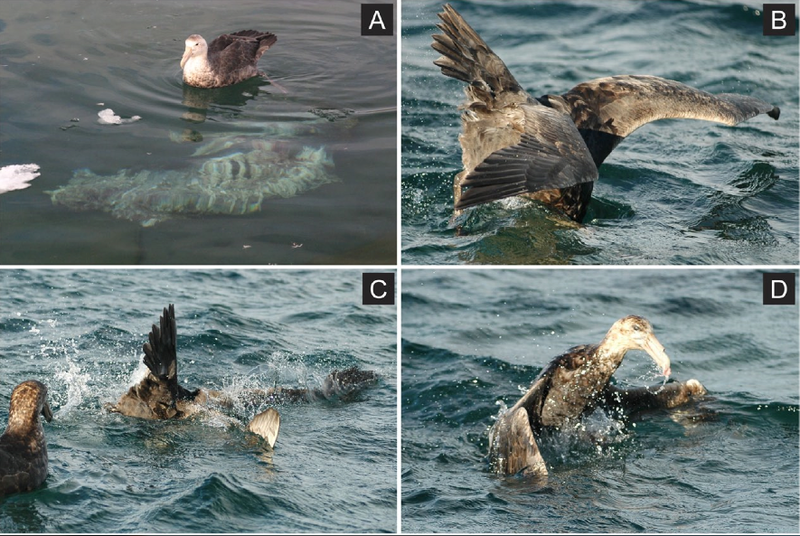 One of my favorite observation recorded of opportunistic hunter/scavenger theropods is of giant petrels (not known for diving abilities) repeated going underwater to scavenge a dead wedded seal. This digression also allows me to finally get rid of a piece of art I did quite a while back. Some opportunistic Coelophysis diving to scavenge a dicynodont at the bottom of some recent flood waters. Take note of the opportunistic pterodactyloids buzzing in for dislodged scraps. Water chevrotains are noted for a thick, dense padding of skin along the rump and around the neck. Skin is actually the largest organ in the body and plays a little heralded but profound role in buoyancy as I discussed in bottom punting Spinosaurus. Readers should note that two other bottom punting specialists - tapirs and hippos - have thick skin and sink to the bottom. It is quite possible that the earliest ornithischians quickly and resolutely diminished their system of air sacs and pneumatic condition - that in conjunction with thick and sometimes armored skin - allowed them to sit lower in the water. Analogous to water chevrotains and other small mammals that utilize the aquatic medium for concealment these earliest ornithischians set in motion a trend of aquatic concealment that - to greater or lesser degrees - likely persisted throughout their tenure with ornithopods like Thescelosaurus. There is no way to tell at this point where various ornithischians sat in the water - if they achieved true negative density like water chevrotains or if they just sat with more of their body submerged and that was good enough. But the point remains that such animals would have benefited cryptically by sitting lower in the water and dispensing with air sacs. But if we assume that the baseline condition for ornithischians was to sit low in the water, when we add density in the form of scutes, osteoderms, thick skeletons, and heavy skulls then we have the likely potential for true bottom-punting, negative buoyancy situations to develop. Among both marginocephalians and thyreophornas we see many likely candidates that may have trended towards negative buoyancy in these animals. For the most part I think bottom punting would have served these animals just fine. They still likely moved with grace and efficiency through bodies of water - they just did not swim in the strictest sense of the word. Moving through relatively shallow streams, rivers, ponds, sloughs, estuaries less than 5 meters deep or so not a problem and waters of this depth would have been what these animals came across in their day to day existence. Indeed a ceratopsid could easily have been prone to flee into the water when chased by a theropod. The theropod in grave danger from a bottom punting ceratopsid as it floats vulnerable at the surface, its belly exposed to horn thrusts. However in deeper waters that they could not get up to the surface in that they found themselves in trouble. I am specifically alluding to the ubiquity of ankylosaurid skeletons recovered from oceanic sediments - were these animals taken by sudden intrusions of sea water that put them in waters too deep to kick off the bottom to the surface in? And then you have the infamous ceratopsid mass bone beds, most notably from Centrosaurus that most likely document tremendous inundations of the ocean onto land. Researchers have struggled to explain why Centrosaurus - and pretty much nothing else but Centrosaurus - succumbed to these inundations. The wikipedia web page on the Hilda mega-bonebed summarizes a lot of the work on this topic. The ubiquity of ceratopsids in these death assemblages is potentially explained by a negative buoyancy for these animals. All the theropods and hadrosaurs in the environment would float away. Ceratopsids were doomed in deep water. Is there any independent evidence pointing us in the direction of thick skin in ceratopsids? By golly yes there is. 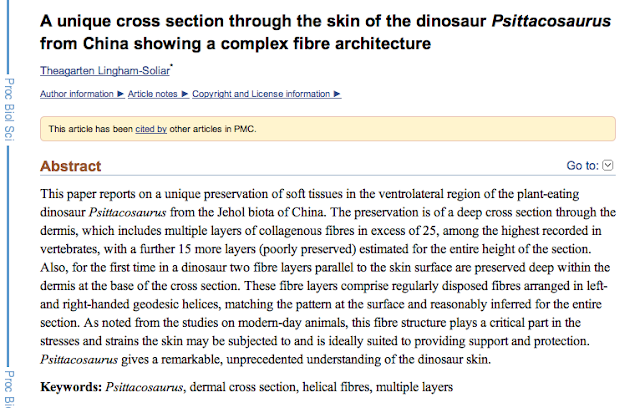 Before the world fell in the love with the preternaturally adorable Psittacosaurus soft tissue restoration there was some other work on Psittacosaurus dermis (Lingham-Solia, 2008). What was revealed in the study is that the Psittacosaurus revealed a cross section cut out that had a remarkable density of 40 collagen layers and a skin thickness of .8 inches - which does not sound like a lot but is pretty astonishing for such a small animal. 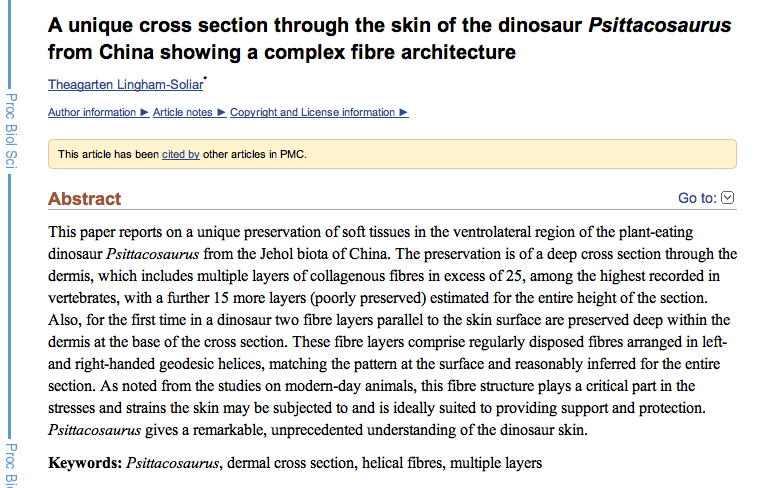 Unfortunately the author behind this work used these multiple layers of collagen to argue that not only was Psittacosaurus not "feathered" - which it wasn't of course - but that the feather impressions recorded on theropods are actually layers of collagen peeling off. The study was pirated by B.A.N.D.I.T. notions and what could have been a perfectly interesting document on exceptional skin thickness got turned into something that it shouldn't have. But let's not throw the baby out with the bath water here. The paper still shows a startling level of skin thickness - among the highest recorded in any vertebrate. Again, let me hammer that point home, "multiple layers of collagenous fibres in excess of 25, among the highest recorded in vertebrates". There was an arms race in the Mesozoic, or more like it there was a skin race. Prey species attempted to evolve the thickest most durable hide they could to thwart those pesky theropods who more than kept pace in evolving forms more adept at sawing or crushing through thick and armored hides. There has been some research into this topic of ceratopsid swimming and buoyancy (Henderson, 2014). 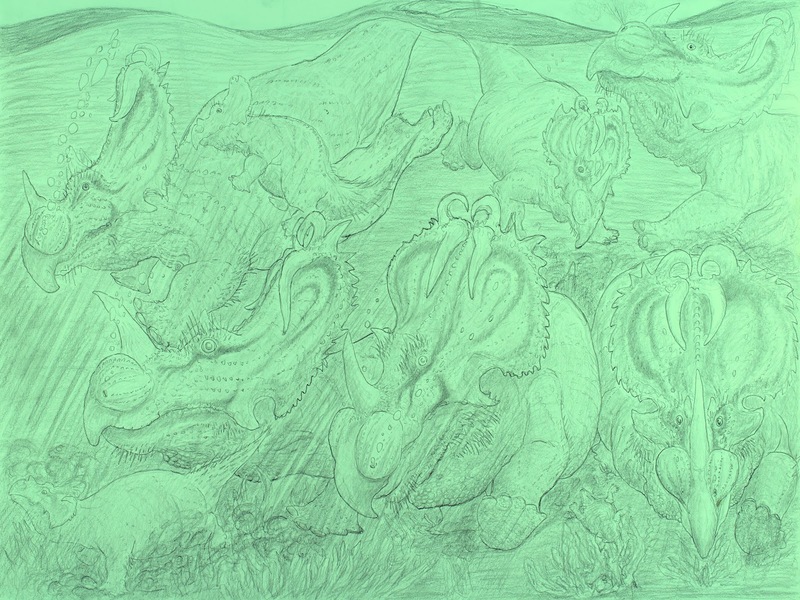 The work concluded that ceratopsids sat in the water with their heads submerged. On the other hand hadrosaurids were much better natural swimmers with their head above water, hence the lack of hadrosaurids succumbing to such oceanic intrusions. This study points us in the right direction but it left out two things; 1) It did not account or even mention skin - a particularly dense skin may have sunk ceratopsids right to the bottom; 2) Pretty much any large tetrapod that lives in and around bodies of water has at least some capacity to move through bodies of water. Ceratopsids living on coastal Laramidia - especially bordering the western interior sea - would have have come across water all the time - lagoons, estuaries, swamps, tidal channels, rivers. It is absolutely non-sensical that an animal that comes across bodies of water daily has no way to efficiently move through them. Long time readers know that this is a constant theme I iterate on this blog: animals have to make sense. They have to reasonably move through their environment; eat; protect themselves; mate. When you conduct research that points you in the other direction - towards a maladaptive animal ill-equipped to deal with day to day encounters (such as bodies of water) - there is probably something wrong with your scenario. Such an animal, so maladapted to it's environment, would be selected for extinction and not leave a fossil record. Whenever you see a paleontologist utter the phrase "failed evolutionary experiments" run away quickly. Now some have taken the mantra "most every tetrapod can swim" a little too literally: I would add the caveat: "most every tetrapod can swim and/or bottom punt". Sinking ceratopsids right to the bottom would at least allow for movement through >most< bodies of water. For a large animal that can bottom punt it can still go through potentially fairly deep bodies of water, at least most bodies of water it will encounter on a daily basis. The problem is when it encounters bodies of water too deep to kick off of the bottom of to reach the surface. Large deep rivers, lakes, and extensions of the ocean can act as barriers to such animals. Or a catastrophic inundation of the ocean. That would be a big problem for negatively buoyant animals. Bottom punting ceratopsids offers a potential explanation for why these animals were selectively killed while no other dinosaurs suffered comparable losses during large oceanic intrusions. It is not that ceratopsids could not move through water - they could quite well as a bottom punter - it is that in deep water they sank like a stone. It must have been horrific for them when the sea took over the land. An article by paleontologist Don Brickman in which he suggests that the Ceratopsids found in the Dinosaur Park formation may have seasonally migrate to coastal floodplains and marshes to reproduce. 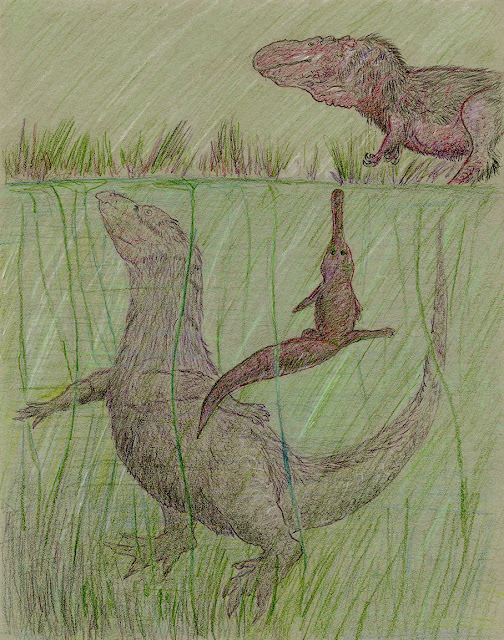 He suggests that it might have something to do with the lower center of gravity and ground pressure of Ceratopsids allowing them to move more efficiently in marshes than Theropods. 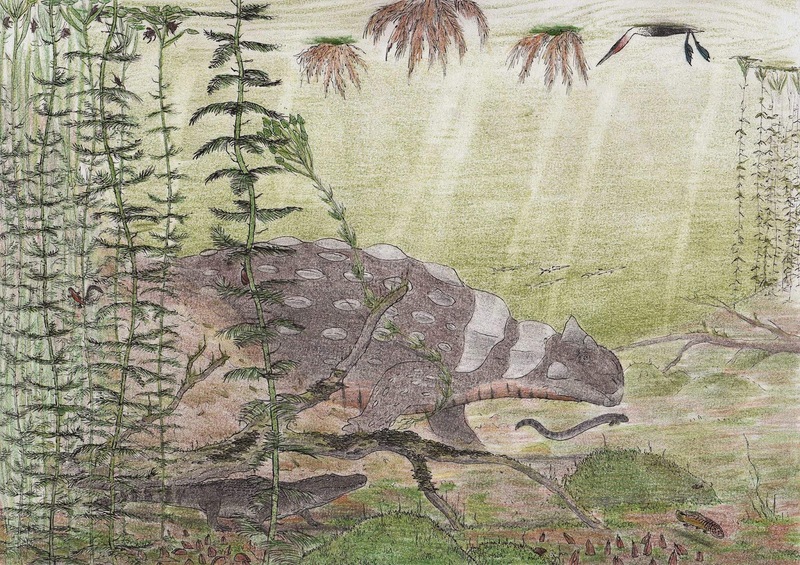 I've read from a few sources that a number of ankylosaur remains had been found in areas that evidenced a nearby water body, and someone even suggested this pattern as evidence towards semi-aquatic lifestyle. I remember that Scelidosaurus remains had been found in marine sediment, and now I see how that matches up with habitual punting after reading this blog. I also remember your previous posts about weak ankylosaur dentition implicating a softer and more diverse diet, including aquatic plants. I started thinking of the possibility that aquatic plants in particular may constitute the majority, or at least a large proportion, of the diet of some ankylosaurs, and perhaps supplemented by terrestrial food sources. But now I'm wondering if that's the case, what would be the implication for having a long tongue? Sirenians like the manatee and dugong graze without needing a long tongue as far as I know. For underwater punting, some parts of anatomy in some ankylosaurs and ceratopsids - namely horns and spikes - do not seem very hydrodynamic. Is a streamline anatomy less necessary for punting as it is for true swimming? I know you addressed defensive implications in ceratopsids, but do you have any thoughts on defensive ankylosaur spikes and tail clubs in relation to semi-aquatic lifestyles? Also, what impact does living semi-aquatic have on nesting behaviors and the required resources for an ideal nesting site? My first thoughts are that low-slung ankylosaurs are too cumbersome to migrate like ceratopsids and hadrosaurs, and dinosaurs can't fast for long periods like ectothermic crocodilians can when it comes to guarding eggs. Yes you are reading in too much. Not semi-aquatic. Long time reader, first time commenter. Apparently some tests were done in SVP abstract(TESTING THE BUOYANCY OF AN IMMERSED SPINOSAURUS (DINOSAURIA: THEROPODA) WITH A DIGITAL MODEL Donald Henderson). Spinosaurus could float. Aren't the only dense bones in Spinosaurus the legs? Many birds have dense femurs and they can float. @anonymous Even the tall neural spines are relatively dense, so no it is not only the legs that are dense. I believe that is the one that Paul Sereno presented? If so I was there. If not there are two studies on buoyancy in the works? Regardless there was no mention of thick, dense skin acting as an additional density mechanism. And here is the crux of the dilemma - how do we test for thick skin? We can't. I make the inference because it makes for a more believable animal. Otherwise spinosaurus - at least in the models I have seen - is the preternaturally awkward floater. An animal that does not make sense. Anyways this post is not about Spinosaurus, the comment sections are still open for the various posts I have done on Spino so go there for questions/comments about Spino and leave a name instead of Anonymous. I will probably just start deleting people who post as anon because of hair-brain trolls lurking. Couldn't it have switched between punting rapidly and swimming slowly, as crocodilians do? @Lam Luong Sorry for brief response earlier, I was at lunch. I stated in the piece that I am not suggesting semi-aqautic lifestyle, merely that underwater punting is a distinct possibility as a byproduct of their mainly terrestrial existence i.e. thick skin in marginocephalians & thyreophorans to thwart predators and combat. However I did suggest that even if early ornithischians were not amphibious they still would want to sit low in the water to better hide in the water ala water chevrotains. Many of the earliest ornithischians are pretty small, dainty creatures and hiding in water (in addition to hiding in burrows, foliage etc etc) is just part of their cryptic arsenal. Thesecelosaurus has often been suggested as a bit of a capybara type animals so this is a potential example of the trend more fully realized. However it is also possible that some thyreophorans were amphibious too but I didn't go there as far as specific species. And I don't think ankylosaurs are as limited in movement as some may suggest due to relatively short limbs. They are proportional to hippo legs and hippos do quite well on land. Great post, as always. 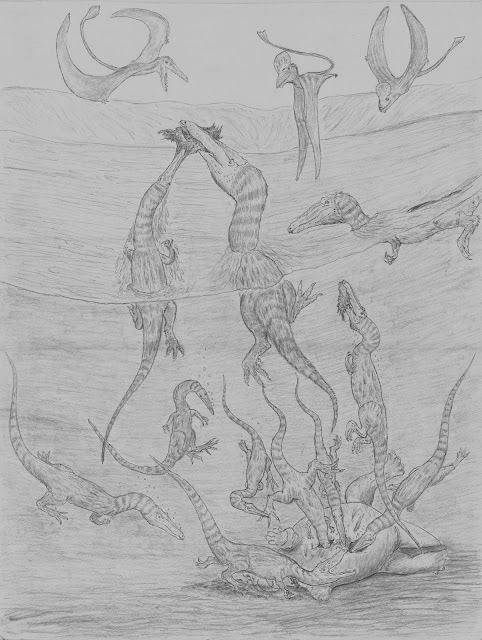 I especially love the diving Coelophysis, I commissioned the inverse of that from Mark Witton a year or so ago: a handful of Coelophysis clambering up from the flooded lowlands to scavenge a drowned Placerias pinned against a small cliff. I'm consistently surprised with how many completely original and, in my opinion, well argued and plausible hypotheses you come up with. Each post I read helps cement this blog as one of the best, can't wait to see what's next. Thanks for the kind word DMyers, very encouraging. I'm glad you get something from it. It's just occurred to me that any water-punting ornithischians near the Western Interior Seaway might've found themselves sharing the water with Deinosuchus. Makes you wonder what sort of interactions a submerged ceratopsian or ankylosaur might've had with a giant alligator! Just because you have ceratopsids preserved in a river channel doesn't mean they were living in a river. The preservational environment is not the same as the environment of death or even the animal's preferred environment. In fact there's naturally going to be a bias towards water-based deposits in terrestrial environments because you don't have much else making rocks. Here in Western Colorado we've got a whole articulated Camarasaurus skeleton preserved on display in a river channel sand. I wouldn't base much of my interpretation of this animal's life mode on the fact it was found in a channel sand. This poor creature could have just ended up on a riverbank to drink when a flood hit. I'd be surprised if there weren't dinosaurs doing what you're suggesting here. I think it is a bit of a stretch to apply it to all of Ornithischia, or even just ankylosaurs and ceratopsians. @RobertGay: The notion of semiaquatic ankylosaurs in particular is poorly founded; although they could certainly swim, it's impossible to say if any were hippo-like in their nautical habits. The supposed evidence for aquatics and carnivore in hatchling Liaoningosaurus, for example, is extremely sketchy. An equally likely taphonomic scenario is that the baby ankylosaur's corpse simply sat upon an already dead fish on the Yixian lakebed. Interestingly, Duane doesn't mention the iguanodont Lurdusaurus, which IS very hippo-like in general proportions. I can't remember the exact study, but it was demonstrated that the lurdusaur's bone density was much higher than other dinosaurs and equivalent to modern marine mammals, suggesting it may have had a hard time supporting itself on land. Guys you should read what I say more carefully. After the first paragraph I write "It is a contention of mine and this piece that just because an animal is not explicitly aquatic does not negate the potential for water to still shape and inform significant aspects of its biology and anatomy." @Robert Gay Points taken regarding taphonomy and nowhere was I implying that ornithischians that might bottom punt or sit low in the water necessarily lived in rivers, bodies of water full time etc etc. Likewise small antelope, deer, chevrotains that hide in water are not necessarily aquatic but in fact spend most of their time foraging and living on land. Water is just a medium to hide in just as burrows and dense foliage are as well. As prey species I am arguing that these earliest ornithischians would dispense with air sacs in order to not buoy up to the surface in water and be such an easy target. Hence air sacs are lost and all subsequent ornthischians inherit a reduced or nonexistent air sac system because of the cryptic adaptations of the early small ornithischians. "Just because you have ceratopsids preserved in a river channel doesn't mean they were living in a river." I'm trying to figure where you got that impression that I was suggesting that from this piece. I really want to know because you are not the first to misinterpret what I was saying. Was it the picture I made of the bottom running centrosaurs? With regards to ceratopsians and ankylosaurs having a hippo-like negative buoyancy in the water I mentioned that this was potentially a byproduct of a thick hide evolved under a regime of saw toothed predators and combative conspecifics. The hippo like water movement I am suggesting is a byproduct of terrestrial adaptations. @Robert Gay The reason I omitted mention of Lurdusaurus (which is quite probably an aquatic animal) is that this post is specifically about terrestrial prey animals that >sometimes< hide or move through water, hence the water chevrotain emphasis. And how picturing early ornithischians as roughly equivalent to small ungulates, chevrotains, and large rodents that routinely forage on land but seek refuge in water might serve as a useful hypothesis for why air sacs were lost. You can't really hide in the water if all those air sacs are floating you above the surface of the water. Lurdusaurus may well be past the point of being a mainly terrestrial animal that sometimes seeks shelter in water. It could have been primarily aquatic both in foraging and habit. 1) Early ornithischians are small cryptic animals. They hide in thick foliage, burrows, and in water. The evolutionary pressure to sit low in the water necessitates loss of extensive air sac system i.e. so that they don't float like a duck. 2) Subsequent ornithischians inherit the reduced air sac system - regardless of how often they use water to hide in. 3) Some ornithischians (marginocephalians & thyreophorans) increase in skeletal and integumentary density. Potentially they no longer just sit low in the water, but sink right down and are negatively buoyant. Their movement in the water would thus resemble tapir, hippos and other thick skinned mammals that bottom punt. However this method of movement in no way is indicative of a reliance on the water or that it is their preferred habitat. It is merely a byproduct of their anatomy and offers the best way to move through it as they can no longer swim. 4) If these animals are in fact negatively buoyant it can offer an explanation for the repeated documentation of ankylosaurs in marine sediments (they got swept away into deep water where they could not reach the surface) and mass ceratopsian death beds due to oceanic intrusions. The got in water that was too deep and drowned. 5) Also potential biogeographic implications i.e. ceratopsids not able to colonize eastern North America until the western interior sea withdrew. Great post Duane. I've been wondering for years why Ornithischians lack the beneficial air sacs found in the rest of Dinosauria. I hadn't really heard any good hypothesis why they lost them either, but this makes perfect sense and is honestly very likely. So various small to medium sized Ornithopods were very similar to modern Waterbuck, Kob, Chevoratain, Tapir, Capybara, etc. I wouldn't be surprised if some Ankylosaurs and some Ceratopsians were semi-aquatic similar to Hippos. At the least I could easily see them often sleeping and resting in water. Thanks Khalil. I didn't want to get into what species may or may not have been semi-aquatic - I didn't want that controversy today. Some people are already misinterpreting my thoughts as suggesting "all ornithischians were semi-aquatic" which is not what this about. "ankylosaurs and some ceratopsians were semi-aquatic similar to hippos" Possible, but again that is not what I am claiming or even suggesting in this piece but I fear…. ughhh I can already see the trouble I got into a bit and how people are going to misquote and paraphrase this piece… "Duane Nash said ceratopsians and ankylosaurs were like dinosaur hippos" No, mainly terrestrial and possibly moved through the water like a hippo as a consequence of heavy and thick armor & skin that was evolved for terrestrial protection. Yeah I didn't mean to skew your words. I clearly see the meaning in your words. And yes I was worrying people were gonna misquote you. I see it often with your work and with the works of many others and especially the major news. I remember when people kept saying that you said that Dinosaurs had mammalian lips or bulldog lips in the unironic sense. Even I said bulldog lips but simply as a metaphor in personal conversation. But hey, that's human behavior to sum up information, even when it gets too simplified. Do you plan on any posts about possible semi-aquatic candidates? As others have said Lurdusaurus is obvious, but I'm betting some Ankylosaurs with their small, delicate teeth could have at least sometimes foraged and grazed in water. nothing in particular planned in those regards. Great post Duane ! Some interesting points made, it should be noted that a case has been made for the much overlooked ceratopsian Anchiceratops as being a somewhat well adapted to a semi aquatic lifestyle. Thanks Robert. Again, as I mentioned several times above, I am not making the argument that ceratopsians or ankylosaurs were especially aquatic merely that bottom punting may be in fact be how these animals moved in the water. I am not totally against it either but that was not my intended argument (though some it seems have taken it this way). Actually first I have heard of Anchiceratops, thanks for reading. Perhaps you could mention armadillos as an analogue? They're dry-to-desert IIRC and they don't eat aquatic matter but their punting is pretty famous. Ah, now that I've actually read this post, I have to say I agree with you. Bottom punting does seem like a likely conclusion, especially considering all that gear. Also, I like the emphasis on skin--it is not just a covering, it's one of our most vital organs, and it dictates how we live. Now that we're here, though, I do have some questions. First of all, I got to thinking about moose, which spend some time underwater grazing. Do we have any evidence for such a dinosaur? Second, you only briefly mentioned hadrosaurs (and their de facto skinlessness, for the most part.) To clarify: are you suggesting that they were able to keep their heads above water? Hi Magpie thanks for reading and comments. On hadrosaurs: for now I would count them as likely to float with at least their head above water. They do have thick skin but lack all that other gear - especially the heavy head gear - of ankylosaurids and ceratopsids. Their heavy and thick caudal musculature and tail would probably slightly tip the anterior of the body towards the surface in water getting the nose or mouth topside, unlike the case in ceratopsids where the only study on their buoyancy (which again is good except for omission of the skin as another source of density) dips the head downwards in the water. Quite a cumbersome design for an animal that - on the low lying coastal floadplains of eastern Laramidia - would encounter bodies of water daily. It is also interesting to think that not too long ago there was a wider diversity of large, thick-skinned, and sometimes armored mammals - giant sloths, glyptodonts, various rhinos, toxodonts - some of these guys may have been underwater punters too, but not necessarily aquatic by habit. This is Khalil. I'm at school so I can't log into my account. On the matter of thick skinned Psittacosaurus, could the thick skinned also serve a thermoregulatory purpose? I imagine a thick hide could keep in heat during the winter months and cold rains of Liaoning. It would also explain why Psittacosaurus isn't fuzzy like it's ancestors and relatives. Maybe for the need to grow a thick dermis for defense (and possibly for aquatic capability like you have suggested), feathers were opted out for a thick dermis for retaining heat and SIGIL's for better regulation/physical defense. Combining the rear gut fermenting within the body cavity creating heat, Psittacosaurus might have been rather comfy in it's own (fat) skin even in the winter. The only feathers remaining on an adult Psittacosaurus might have been the defensive bristles on the tail. @Khalil Indeed I've often pondered that scenario. Respectable scientists, however, would be aghast at piling on multiple speculative hypotheses on top of one another like that. SIGIL plus negative buoyancy, plus rear fermenting compost heat, plus aquatic ankylosaurs, plus fleeing volcanoes into the water. Not saying you are totally wrong but just don't expect the vast majority to go with you (or me) into those realms, Too tenuous. My thoughts drift in the same direction and it is indeed peculiar that if there is anywhere we should find fully feathered ankylosaurs and ceratopsians it is Liaoning. The mere fact that we have reportedly hundreds of specimens for these guys from these deposits, beautifully preserved, and they don't have coats of insulating filaments while the theropods from the same environment and of about the same size DO have preserved insulatory coats should give us moment to pause? What were these ornithischians doing differently? I do suspect it is a combination of SIGIL, countercurrent heat exchange, and rear-fermenting heat production. Oh I know it's completely speculative once you use hypotheses to back up your own hypotheses. I just typed down what flowed in my mind. Will you expand on this odd way of thermoregulation in another post? Also, I've had the same question bugging me for YEARS now. Why is it that everything that is a Theropod, basal Ornithischian (looking at you Tianyulong) or a basal Neornithischia (Kulindadaromeus) is uber fluffy, but everything else is scaly even in the exact same conditions? I have assumed in recent years that feathers were a basal trait and that various lineages implored some other forms of integument as time went on for various reasons. If SIGIL is true then feathers and SIGIL are more or less basal to Dinosauria, but because they are BOTH ancestral then different lineages had more options on how to tackle thermoregulation and even defense in the form of quills, armor, etc. Maybe feathers weren't necessarily better than SIGIL and vise versa. Maybe the use of either depended on other factors not necessarily for thermoregulation. Like how SIGILs would be better for armor/defense from predators. Or how shaggy feathers might be better for a predator that is trying to break up its body outline while hiding/stalking prey. Who knows for now. All I know is that something weird was going on with Dinosaurian integument, and all this means is that there are WAAAAY more ideas and hypotheses that can be played around with in paleoart. I used to be the feather nazi in recent years, but now I'm really liking the idea of even some Theropod lineages being primarily or almost completely scaly. Still not as speculative as an uber feathered Sauropod (nothing to say against basal Sauropodomorphs though), but either scenario is still plausible. No post as of yet in those regards I pretty much put all that stuff into the SIGIL post. I know it is not en vogue but I don't think feathers were ancestral to dinosaurs but more of a croc-like dermal pedigree. Other stuff then got added on top. Worth noting is that downy feathers are only known from Coelusauria. Downy feathers vastly improve thermoregulation, especially when you compare it to more basal feathers. Maybe the reason why Coelurosaurs aren't predominantly scaly is because down feathers (combined with the out layer) is as beneficial if not more so than SIGILs. Hence the general loss of SIGIL, yet is a mainstay in the rest of Dinosauria (and is a constant in many lineages). I was just recovering from the shock of an aquatic Liaoningosaurus and then here you come along and shock me with more nonsense about aquatic Coelophysis! Umm…. wut? I think you misread me, I did not call Coelophysis aquatic I merely depicted it opportunistically diving after a dicynodont carcass at the bottom of a flooded pool. More to the point I wanted to depict how the buoyant nature of such theropods would make diving somewhat laborious - they would probably pop right back to the surface.